Sony AS100V Camera Review – Some issues that annoy me. I’ve decided to go for Sony instead of GoPro Hero 3 to record my daily comute on the bicycle. A friend lent me his GP3 along with a very strong clamp for the handlebars – results: the GoPro video was all jelly. Running deshaker for each video is not fun thus … based on the comparisons on Youtube, I’ve decided to go for Sony as100v (with Live View). Since everybody knows the good parts already, I’ve decided to post a list of issues that I do not like about the camera. Currently it is still running version 1.0 of the firmware. a) GPS Overlay is nice, but it is very tedious to use. First, you almost can’t do anything with the videos from the camera, but to import them locally. 1 hour of PRO mode quality footage created a 31Gb file (out of the 64Gb SDXC card) which I first had to import locally before applying GPS Overlay. It took about 40 minutes to be copied (the laptop is an old generation i7 with Samsung SSD 840 PRO / USB 2.0). To add overlay to a 1 hour PRO movie while converting it back to 1080p @ 30fps took 7 hours! CPU was at 50% all the time and no other heavy CPU / hdd applications were running. b) The camera doesn’t seem to be very sharp at infinity even with Image Stabilization on. It seems it is in perfect focus between 1 and 10 meters, but the buildings far away (even if square) they don’t appear crisp. I think GoPro produces footage that looks sharper. 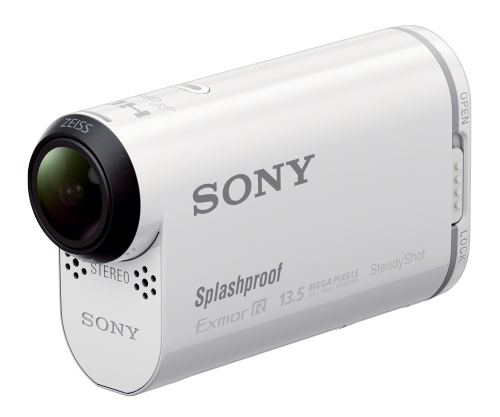 However, between having a jelly GoPro footage (that looks very good when sitting at stoplights) vs having a not so sharp footage but more relaxing to watch – the winner is Sony. c) The marketing gimmick with SPK AS2 Waterproof case which can’t be used to crisply record Underwater! Due to the sphere shaped window – the footage won’t be crisp at all. You need to buy the old waterproof case (SPK AS1 + the flat window AKA RD1). Still, the combo is still cheaper than Go Pro (I guess). d) You can’t remove the videos from the Camera using PlayMemories software. It worked once, but now the camera is mounted read only, and I can’t remove them from Windows. I decided (since I had everything imported anyway) not to take the microSD card out, but format it using the camera. e) After formatting the card using the camera, I now realize that the camera splits the movies into 4Gb chunks. So instead of having a 10Gb file, you have to merge 3 files (2 x 4Gb + 1 x 2Gb). So now I have to format again. Given how SLOW it can be to apply the GPS overlay (point a) above) then I will probably give up on using PlayMemories all together and just manage the recordings via microSD card directly. g) GPS sometimes looses signal and you ride with 0 km/h many minutes out of the city. Or, until it gets a lock, reports that you ride with 40km/h when you just started. So the first 1-2 minutes, the speed is off.